New Haven — Gov.-elect Ned Lamont reacted cautiously Thursday to several days of good economic news, saying improving tax revenues, economic activity and job creation are coming at what is likely closer to the end than the beginning of an economic expansion in Connecticut and the rest of the U.S. Speaking to reporters after introducing 19 members of a steering committee for his transition, Lamont said he has no intention of balancing his first budget by relying on the suddenly flush rainy day fund that Gov. Dannel P. Malloy will be leaving for Lamont, a Democrat who takes office on Jan. 9 with solid Democratic majorities in the General Assembly. House Speaker Joe Aresimowicz, D-Berlin, said use of the rainy day fund undoubtedly will be a matter of conversation with the new administration. Lamont said his administration is intent on making unnamed structural change to the state’s budget in an effort to break the cycle of budget shortfalls that have plagued Connecticut as it slowly recovers from the Great Recession of 2008. A report this week from the U.S. Bureau of Economic Analysis pegged annualized economic growth in Connecticut at 3.1 percent in the second quarter — the same as New York and better than Rhode Island, but trailing Massachusetts. And state tax revenue projections surged, shrinking the projected shortfall in the upcoming two-year budget and leaving Connecticut with nearly $2.1 billion in reserves to combat the deficit. Lamont’s caution is certain to be a source of tension with some members of the General Assembly, especially those intent on increasing state aid to municipalites. 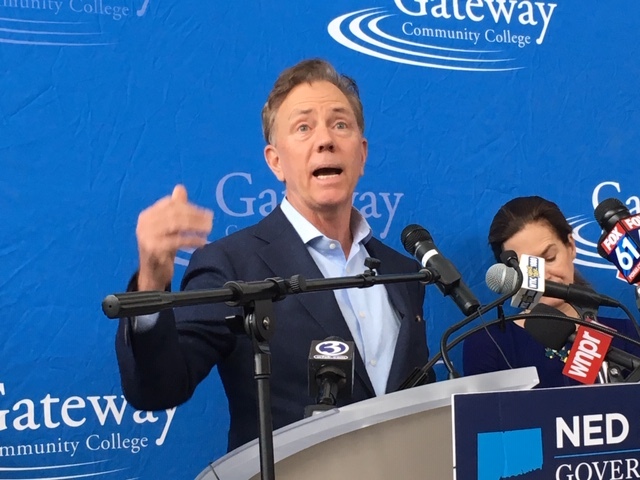 Lamont and his running mate, Susan Bysiewicz, said their administration will do everything it can to continue and improve the economic growth. But Lamont, a Greenwich businessman, also showed unease about basing his first budget on an expectation of greater growth. Lamont will be spending the weekend in Colorado with other recently elected governors at a seminar offered by the National Governors Association. In a monthly jobs report released earlier Thursday, Connecticut’s jobless rate remained at 4.2 percent. Like Lamont, Gioia saw the growth as positive, yet fragile — reasons to focus on fiscal stability to workforce development. “The important thing right now is for policymakers to do things that will continue this growth and, if possible, accelerate it and not do damage,” he said.